Why Link? Link has already made itself known as a godsend. 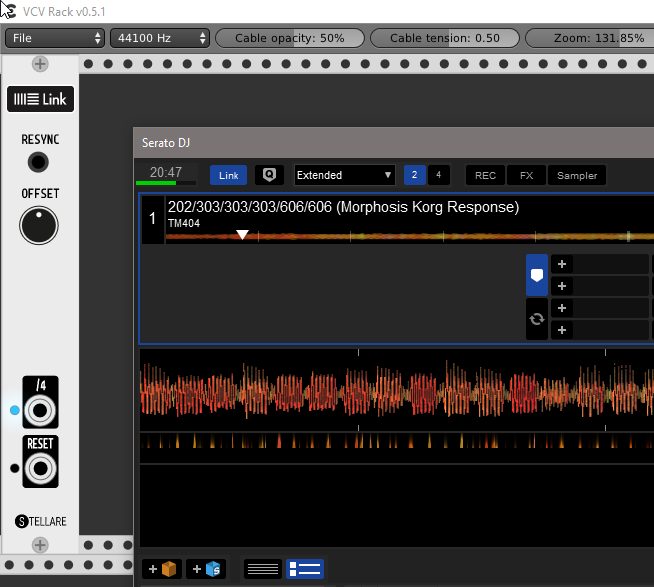 Not only does it work in Ableton Live, but Traktor, Serato, Reaktor, and Reason, and others. It works with numerous iOS apps, too. Get those tools on the same network (probably via wifi router), and all of them can use the same tempo and transport. There’s no master, no slave – in the style of a jam session, everything follows a shared tempo – which also means you don’t lose timing if one drops out. And Link is a logical choice for VCV Rack. Both have an open source base. And whereas you own physical analog gear and modulars, you’d use clock signal by connecting a cable, here in the software domain, wireless, networked clock is just as useful. Think modular. Even with the latest copy of VCV Rack, you don’t see a big, friendly “Link” button in the corner. Remember that the whole metaphor of Rack is that you have a virtual rack of modules. You’re going to have a module doing the Link synchronization – and you’re going to be able to use Link in some more modular ways. That article also includes instructions for building from source, though here we’ll use pre-built software for ease. 1. Grab a copy of the Stellare Link module. Link comes from Ableton, but it’s open and available to developers. So our friends Sander and Enzo (Stellare Modular) made their own virtual module for Rack. To get it, head to vcvrack.com and select the Plugin Manager. Type “Link” into the search box, then click “Free” to highlight it. This adds the Link module to your account, and will synchronize it to any Rack setup. 2. Synchronize your Rack. 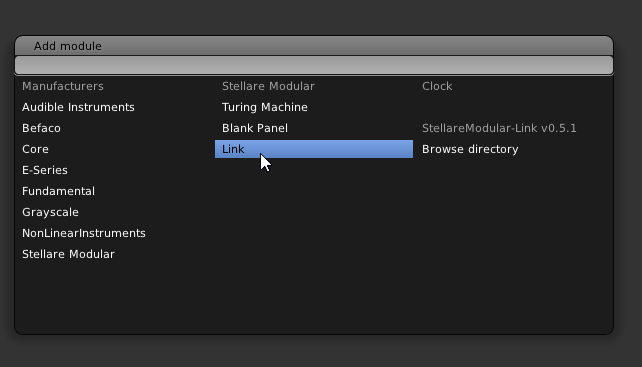 Now with Stellare’s module attached to your account, you need to install it to your machine. 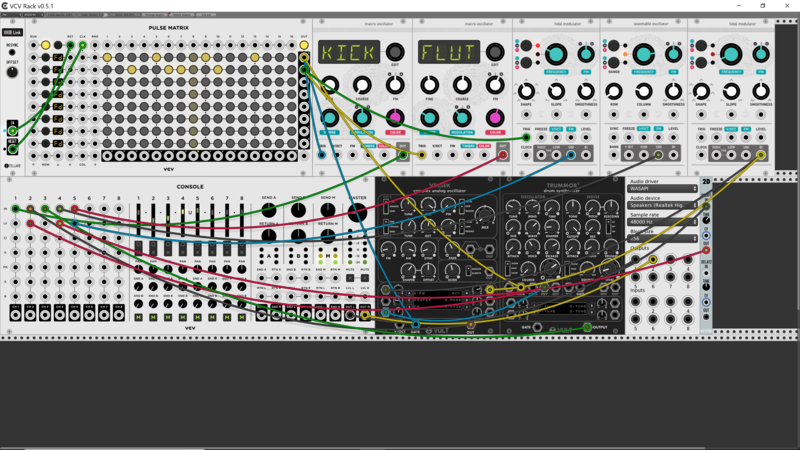 Launch VCV Rack (you need a current version), and click Update Plugins. You should see a progress bar appear, and you’ll be prompted to restart Rack. — so that link-wrapper.dll is on the same level as Rack.exe. 4. Add the Link module. If you’ve performed the above steps correctly, you can now add the Stellare Link module to any rack. Right click in a blank space, then choose Stellare, then Link. 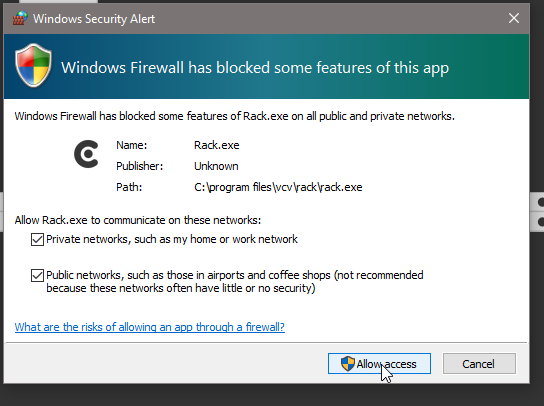 On Windows, you may be prompted to enable access for Rack on your network; make sure to check both boxes, and then choose Allow Access. 5. Get something to sync. Any iPad on the same network, running an app like Modstep or Elastic Drums, or any local desktop software (Ableton Live, obviously, but here for fun I chose Serato DJ instead) can now jam along with VCV Rack in perfect timing. Make sure “Link” is enabled (highlighted) in the associated software. 6. Play with clock! We’re on to the fun part! The “/4” output jack on the Link module represents quarter divisions of the current Link clock. Reset sends a pulse on each subsequent downbeat. You could obviously get fancier than this, but you don’t need the Link module to do much more – you can divide or multiple that beat with other modules. Here are two free modules (both installable from plugin manager) you can try out as gateways from Link to other stuff. Add Grayscale > Algorhythm. Try connecting from the “/4” output on Link to the “CLOCK” input on Algorhythm. 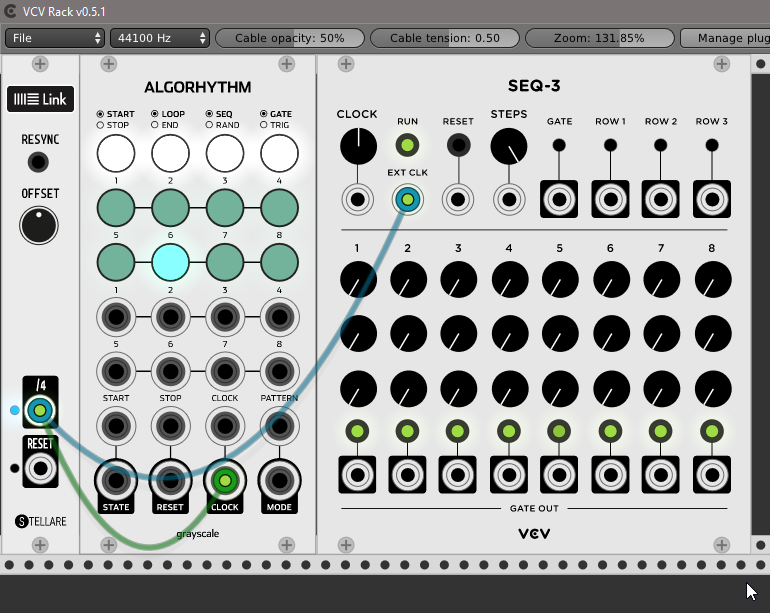 Click the start/stop at the top left of the Algorhythm module, and you’ll see Link advance the clock. Now add Fundamental > SEQ-3. (As the “Fundamental” name implies, you should almost certainly install this selection of modules.) Connect from “/4” out on Link to “EXT CLK” on SEQ-3. Now, the bottom row will advance at the same rate. Try moving the patch cable on the SEQ-3. Drag on the end connected to “/4” – move it so it’s connected from ‘RESET’ on Link to ‘EXT CLK’ on the SEQ-3. Now, the sequencer advances on every downbeat. From here, you can experiment with other modules that take signal, clock dividers for transforming metrical divisions of the signal, and more. A great place to start is by installing the Simple modular pack, then selecting Simple > Clock Divider. This will give you some different, musical divisions of that incoming clock. Ted Pallas, who has been contributing our tutorials so far, uses that 1/16th signal to drive the VCV Pulse Matrix modules. A super cool feature I hope to see repeated next to every Link button I ever encounter is seen here for the first time: there’s an offset knob, and if you spin you’ll shove the link signal forwards and backwards in time. This knob allows you to really dial in the perfect sync between Rack and the larger system you’re trying to lock to. I’ve also used to Offset knob as something of a “swing designer,” placing my sequencer rhythm ever-just-so alongside a Tr-09. Oh, and another thing: there’s a lot of room for happy accidents and mistakes that wouldn’t make sense in another context. Because you’re just messing with signals, you may discover that something that isn’t theoretically what you intended is something you musically like. And since music is about making decisions based on taste, that opens up possibilities. The Link module isn’t a complete implementation of everything Link can do. There’s no way to transmit clock from VCV Rack using it, to adjust the tempo of other connected hardware and software on your Link session. And there could be additional rhythmic options built in. But it’s free – so if you are already enjoying it or if you want to encourage such features, here’s a thought: donate to the developers!